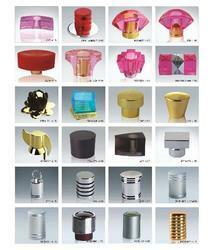 We are a leading manufacturer, exporter and supplier of high quality Plastic Perfume Bottle Caps. These bottle caps are designed with precision by utilizing top grade material under the management of competent personnel at our end; these bottle caps are accessible in diverse stipulation in order to meet the multicolored requirements of patrons. We are offering these bottle caps to our clients at rock bottom cost. Looking for Plastic Perfume Bottle Caps ?